Tyler is an investment broker at NAI Vegas specializing in office and industrial properties. 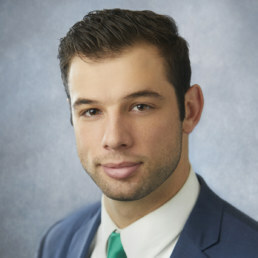 In his first year of commercial real estate , Tyler closed over $12 million in transactions ranking him among the fastest starts in the industry. He and his team have quickly become the market leaders for private client office sales in Las Vegas. Tyler has a hard-working, collaborative, and team-oriented approach to his business, built from his years playing college football at Baylor University. Tyler graduated from Baylor earning Academic All-Big 12 football honors 4 years in a row, and played a role in one of Baylor’s Big XII Championships in 2014. Speaking about Tyler, Jon Walter, COO at NAI Vegas said “Tyler is an amazing team player who knows how to execute a winning strategy for his clients. When he sets a target, he doesn’t stop until it is achieved, making him a valuable asset to his clients.” Locally owned, NAI Vegas is a leading provider of commercial real estate services in the West. Operating as NAI Vegas in Nevada, and NAI Excel in Utah and Idaho, its local offices are part of the NAI Global network of over 400 offices and 7,000 professionals covering nearly every major market nationally and across the globe. Tyler is an investment broker at NAI Vegas specializing in office and industrial properties. In his first year of commercial real estate, Tyler closed over $12 million in transactions ranking him among the fastest starts in the industry. He and his team have quickly become the market leaders for private client office sales in Las Vegas.